Utes in review: Utah wins a ticket to its first Pac-12 title game. But how does the battle vs. BYU affect those plans? An alternative strategy such as resting players in a rivalry game would be unusual in college football. Boulder, Colo. • Snow angels created in Colorado and the Sun Devils' fumble against Oregon are the lasting images of Utah’s first Pac-12 South football championship. Britain Covey, Jaylon Johnson and other players enjoyed the successful end of the Utes' conference schedule Saturday. 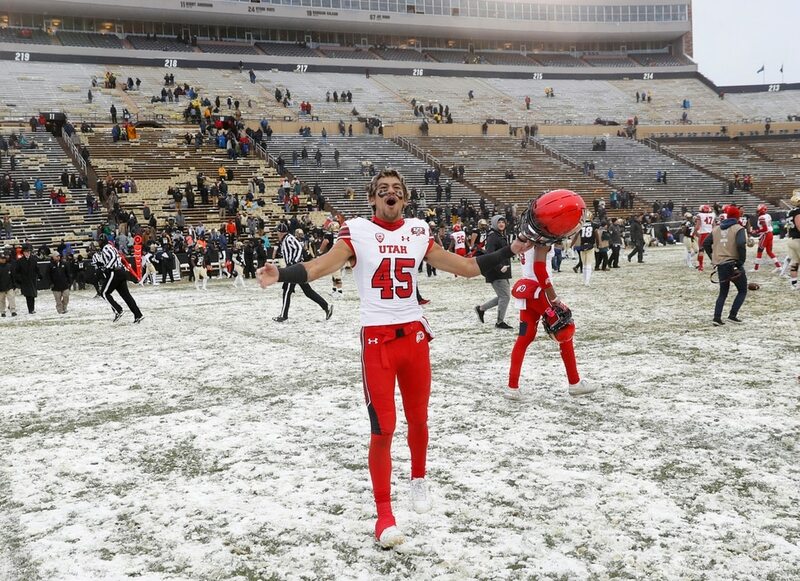 They sprawled on the semi-frozen, snowy turf of Colorado’s Folsom Field, where they had beaten the Buffaloes 30-7. Nearly 10 hours later, as the calendar turned to Sunday in Utah, the Utes had even more to celebrate. Arizona State’s 31-29 loss at Oregon gave the Utes the South title. More accurately, Utah earned it. “Just proud of how these guys have hung in there all season long,” coach Kyle Whittingham said. 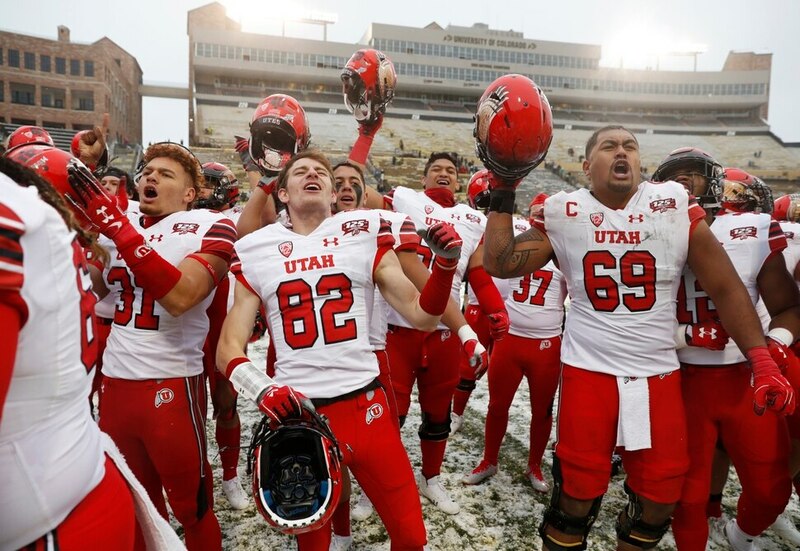 The Utes (8-3, 6-3 Pac-12) pushed through a conference schedule that started with losses to the North’s top two teams — and they’ll get a rematch with one of them in the Pac-12 championship game, Nov. 30 at Santa Clara, Calif. The winner will represent the Pac-12 in the Rose Bowl. Utah will learn its opponent Friday, when Washington and Washington State stage the Apple Cup at Pullman, Wash. And then the Utes will host BYU on Saturday, creating an entirely new dynamic in the rivalry. Knowing they’ll play one of the biggest games in school history six days later, will the Utes use any alternative approach vs. BYU, such as resting key players? That would be surprising. In any case, the convergence of events in Utah’s favor in Colorado and Oregon lifted the program’s November hex. Even a game they could only watch made the Utes and their fans agonize for nearly four hours, but it turned out well. Arizona State had the ball near midfield after an interception in the last four minutes, needing a field goal to win. Oregon’s La’Mar Winston Jr. will have a place in Ute lore after he stripped ASU quarterback Manny Wilkins and Gus Cumberlander recovered the fumble. Two more games remain this month, but never again will Ute followers go into November convinced that everything will conspire against their team. The Utes ended their Game 11 Curse (remember last November’s finish at Washington?) by winning their second-to-last game of the regular season for the first time since 2011. • Utah’s third quarter evoked the team’s best 15 minutes of the season, at a critical time. The Utes posted 182 total yards to Colorado’s 19 yards and scored 17 points. Utah’s first drive ended with a field goal for a 10-7 lead that seemed tenuous, but two touchdowns basically ended the game. Offensive failures hurt the Utes in the second halves of their three losses, and they also had a poor third quarter against Oregon, but Saturday was another story. * The Utes' defense dominated. Colorado had two sequences of three lost-yardage plays in a row, and Utah recorded 16 tackles for loss. The Buffaloes even went backward on two pass completions during their first possession. • Resting players in a rivalry game would be highly unusual in college football. Schools including Clemson, Georgia, Florida and Stanford have done this, playing nonconference rivalry games the week before conference title contests. The Rose Bowl would remain available to the Utes even if they lost to BYU on Senior Night, but two losses going into bowl selections might affect their backup destination. That also would create the possibility of Utah’s historic season ending with an 8-6 record. Francis Bernard. The former BYU linebacker's role increased suddenly, after Chase Hansen's targeting ejection in the first quarter. Bernard responded with a team-high 10 tackles, including eight solo tackles and three for loss. Runner-up: Maxs Tupai. The defensive end’s 3½ tackles for loss (including a sack) all came in the first half, as he showed his athletic ability by chasing Colorado quarterback Steven Montez. Jason Shelley connects with Jaylen Dixon for the TD. Runner-up: Covey’s weaving, 19-yard run with a short pass on third and 10 on Utah’s next possession. Another case of Covey’s making something out of seemingly nothing sustained the Utes' drive toward a 24-7 lead. In an 8 p.m. game Saturday, the Utes can earn an eighth-straight win over BYU and position themselves to tie the rivalry’s record streak (for either school) of nine games in Provo next August. As a Ute fan, I’m certain that in the future when I die, it will be in November.